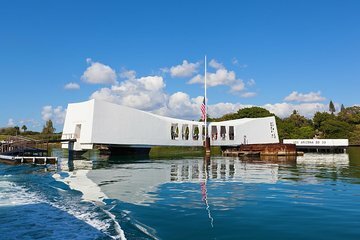 Pase el día explorando Pearl Harbor y vea los monumentos y exhibiciones de la Segunda Guerra Mundial. Visite el USS Arizona Memorial, el USS Bowfin y el Pacific Aviation Museum. Evite esperar en filas con boletos garantizados para el cine y el ferry. It is a long day. However, it is truly the 100 WW2 experience it bills itself as and gives a city tour of some highlights of Honolulu I would not have gotten any other way. Great tour, perfect amount of time at each destination and love skipping the lines!! Great tour of the Arizona and the Missouri. Lunch which we choose to purchase separately was lacking. The last part of the tour was rushed and not very detailed regarding the city sites including the National Cemetery.would have preferred to stop at this location. A well organised tour. Enough time was allowed for each section of the tour. The guide gave very clear instructions about how each stage of the day was going to run. Thoroughly recommend this tour. Very disappointed that the ferry to USS Arizona was suspended due to the high winds. It was a bit difficult to understand the tour guide. Everything else was great. Thank you. Such a historic site. Humbling yet a wonderful monument as well. Guide was full of information, made the trip even more enjoyable. We very much enjoyed the visit at Pearl Harbor, the aeronautics museum and the tour/visit at the USS Missouri. The rest of it we would have been very happy to skip a bus drive-by through downtown Honolulu and military cemetery. Our driver, while perfectly pleasant, had done this trip one too many times and much of his commentary sounded rote. And I recommend skipping the prepaid VIP meal at the aeronautics museum. One other thing we hadn't anticipated -- due to windy conditions, we weren't able to see the Pearl Harbor memorial close-up. No one's fault, but worth noting if you're making your plans last minute and have a sense of the weather conditions. I liked the tour because I felt like I saw everything and the tour helped us do it effectively in 1 day.